The Commission on Accreditation of Rehabilitation Facilities (CARF) was established in 1966 as an alternative to Joint Commission certification. Services provided by rehabilitation facilities are subtly specified in different ways than general hospitals. It’s fitting, then, that they have their own, more specified accreditation system for their services. The sensitivity of these services points to a need for special accreditation. When patients are in the market for such services, accreditation and reputation will matter not only to the patients, but also to their families and support systems. Facilities know this and that’s what many choose to apply for CARF accreditation. That’s right- they choose. A CARF accreditation is voluntary. That means that organizations seeking the accreditation do so on their own time with their own resources and money. Facilities that take the time to do this do so because they understand the value of accreditation to the consumers (i.e. the patients). Do a self-evaluation of your facility. Pretend that you are the accreditation team and look at every process in your organization, keeping your eyes open to changes in workflows. When you’ve finished an internal review, make changes to efficiencies, safety or anything else that came up during your review. Request an on-site survey from CARF. Ideally, anything that they find will be new to you, assuming you were able to fix or improve what was uncovered during your internal review. Review the results of your survey. 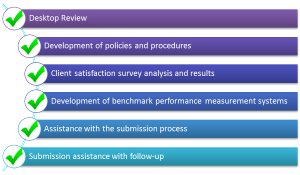 The results will include a written review of your services, including areas of strength and places that need improvement. If your organization has achieved the strict standards outlined by CARF, you’ll receive accreditation. If not, you now have a written report outlining the changes you need to make to be eligible, so, you can start the process over again. Three-Year: A “full accreditation” where the organization has proven that they meet or even exceeds the standards of accreditation. One-Year: The organization still has some work to do to improve services, but they have demonstrated the willingness and resources to implement these changes, so they are still awarded a certification conditionally. Provisional: After the One-Year accreditation has expired; the organization will be reviewed for a potential Three-Year accreditation. If they have not made the necessary improvements to advance, they will become non-accredited. Nonaccreditation: The organization has major changes to make and is not yet ready to receive and uphold accreditation. There are also a few other provisional levels that make some allowances for new organizations and organizations that need to be accredited, but with some limitations or stipulations. The CARF website does an excellent job of displaying the benefits of CARF accreditation. They conducted a study that showed, longitudinally, the difference that CARF accreditation made to the organizations it certified. So, CARF is proven to increase revenue, both through increased patients as well as improvements to budget and ROI. Organizations can also expect to save money by avoiding financial penalties for areas of deficient in patient safety. CARF is recognized internationally as the gold standard of accreditation for rehabilitation facilities. Knowing what obtaining the certification entails, you can be sure that organizations that receive the accreditation are committed to quality, patient safety and satisfaction.